For the first time my Witch hazel, Hamamelis mollis ‘Wisley Supreme’, had a few showy flowers in mid-February. What a thrill! Unfortunately, I planted it where it barely gets a ray of sunshine so it will have to be moved, especially if I want that gorgeous fall color. Mahonia aquifolia, the Oregon grape holly, flowered later this year. In winter of 2015/2016 it actually opened in December and was visited by 100’s of bees on a sunny day. This winter the flowers opened in mid February and I didn’t see many bees. Not native to North Carolina, nevertheless, it likes it here in our acid soils. Supposedly a suckering plant, it has not done that in my garden so far. However, it does seed. I now have three plants scattered over my woodland garden. Horrible if you have to remove weeds or leaves under this shrub because the leaves really are very spiny, piercing through clothing and gloves. Still, I would not want to be without it. One of the very best winter flowering shrubs in my shade garden is Skimmia x confusa ‘Kew Green’. Rarely seen on plant lists, I obtained 3 one gallon plants from Heronswood ten years ago, right after Ball purchased that company. I planted all three in a group and now they are about 30 inches high by six feet wide. When they flower in late winter the scent is fairly strong but, alas, the buds don’t open every year. Nevertheless, even the pale creamy buds are showy and the foliage stays reliably and beautifully unblemished and bright green. Absolute essential if one is lucky to be able to grow Zone 7a plants is Edgeworthia chrysantha. It became available in the Asheville area just a few years ago and I have two, one in partial shade and another in nearly full shade. Both start to flower with the first few warm days, December in 2015/2016 and early February this year. The fragrance wafts throughout the property, especially when the sun is shining. Hundreds of bees and other insects hover over this shrub. Because it flowers so early, a forecast of freezing nights is always unnerving. But even if some of the flowers open and then cold weather returns, they come back in full force when it gets warm again. In addition to flowers and fragrance, this shrub has the most beautiful silver flower buds all winter and totally faultless large green leaves the rest of the growing season until leaf drop in late fall. Branches and stems are a beautiful bright chestnut brown. Edgeworthia tends to make continuous new growth from the bottom so can become quite large, eight or more feet wide and about that high but is easily pruned. One I saw growing in the Rhododendron collection at the UNC Botanical Garden in Charlotte was pruned into a small tree. Two more winter flowering shrubs in my shade garden are Daphnes. At the left above is Daphne odora ‘Aureo Marginata’, in bloom every February and on into March. The white flowering Daphne came to me as ‘Somerset’ and it may be D. x burkwoodii ‘Somerset’ though I see absolutely not a trace of pink in either bud or flower. I suspect it is more likely D. odora ‘Alba’. Both are intensely fragrant, flower for at least six weeks, are roughly 30″ high by 30″ wide, evergreen and indispensable. Supposedly finicky plants, I really don’t do anything to them other than cutting short pieces to bring into the house for fragrance and winter cheer. Finally, among early flowering shrubs in my garden are two small leaf rhododendrons, ‘Lemon Tea’, and ‘Mary Fleming’ with lovely apricot/yellow/white flowers and reddish olive winter foliage. It has been a favorite of mine for years. In NJ it opened every year around April 15, in NC it opens its flowers with the first warm week in February and, sadly, often those early flowers are dried beige after the next super cold night. Rh. ‘Lemon Tea’, with very pale lemon lime flowers and very small dark olive leaves also opens in March. Very pretty combined with blue flowering Scillas. ‘Mary Fleming’ grows upright to 8 feet high while ‘Lemon Tea’ spreads more horizontally. This one is new to me and I am not quite sure how tall it will be eventually in mostly shade. This year, Iris reticulata ‘Harmony’ was in bloom on January 18 and lasted until we hit warm weather in early February. More and more iris opened in different locations, first on a warm west facing bank, then in sunny areas in the woods, and last on west facing slopes that had considerable shade. For the first time in many years Snowdrops (Galanthus elwesii) opened in December, January and February. Some of these are finally starting to clump up. This year I added 200 more in a new section in the woodland garden. I really don’t know what made me do it but I soaked the bulbs overnight with good results. In past years, I would plant 100 and maybe 20 came up. Helleborus foetidus (Stinking Hellebore-but why? it doesn’t stink!) has been in bloom all of January and February and even now in early March is still going strong. This is a fabulous plant to add color to the winter scene, especially when seen against dark conifers and hollies. It is short lived but seeds liberally in places it likes or where ants drop the seeds. My personal favorite of all the Christmas roses is Helleborus niger. It’s a reminder of thousands that grew on a large bank along the Traun River in Austria where I grew up. There they literally came out of the snow in December and we would pick a bunch and lay them in a soup plate with a rock in the center over the stems and by morning the stems would rise up vertically so the whole plate became a plate of Christmas roses. I have just a few heather and heath plants because I don’t have enough sun for them to grow happily. They were planted 14 years ago, labels have disappeared. One of my favorite for year-round color is Erica carnea ‘Springwood White’. Adding brilliant gold to the winter landscape are several of my dwarf conifers. I grow a number of Chamaecyparis and Thuja, as well as Picea (a. Skyland) that maintain their gold color throughout the year. Actually, they are not really gold for me since I have so much shade but I prefer the softer gold – more chartreuse – in a woodland setting. A favorite is Pinus strobus ‘Winter Gold’ shown above. I have so many conifers, rhododendrons, evergreen azaleas and hollies that the woodland garden never really looks gray and drab throughout the winter months. Add to all that green and chartreuse the luster and shine on Magnolia grandiflora leaves, several of the hollies, and, colorful branches of shrub dogwoods like ‘Midwinter Fire’, there is truly a lot of color all throughout November, December, January. Then come all the little bulbs in quick succession. Hydrangeas in all their variations are the highlight of my summer garden. 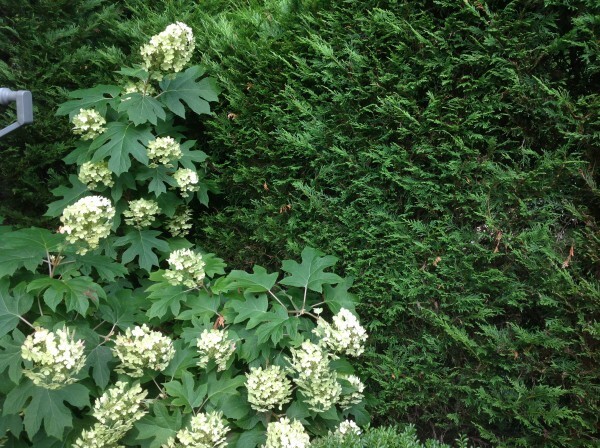 Above, H. arborescens ‘Annabelle’, planted next to Cornus alba ‘Elegantissima’. I am also trying out ‘White Dome’, a subspecies according to Dirr. I have not found it to be very abundant with flowers. 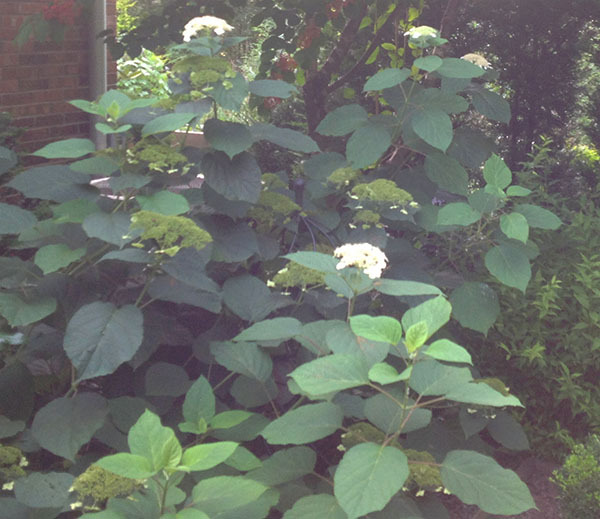 Recently I came across Hydrangea arborescens ‘Ryan Gainey’ on a garden tour. Supposedly, the flowers are smaller and the stems stronger than ‘Annabelle’. 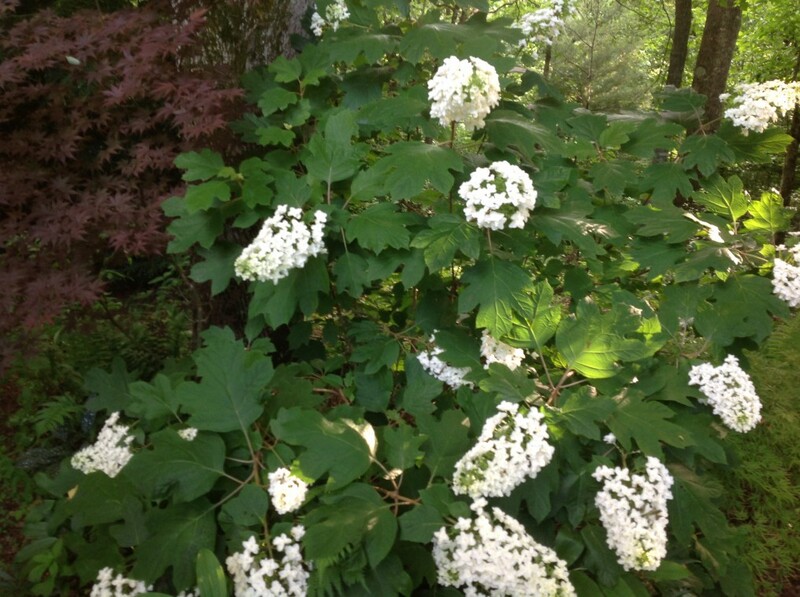 Growing 3-5 feet tall by 5 feet wide, the plants I saw in bloom did not flop the way ‘Annabelle’ does. Also flowering throughout June and July is Hydrangea quercifolia. 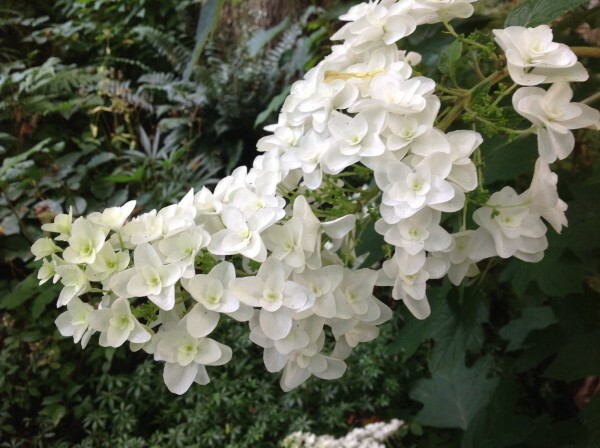 Native to the Blue Ridge Mountains, I grow only a few of the species in deep shade and have concentrated on the double flowering ‘Snowflake’. I first saw it in ‘Polly’s Pen’ on Martha’s Vineyard years ago on an American Conifer Society tour. It was shown to us by Polly Hill herself. To me it is without compare. 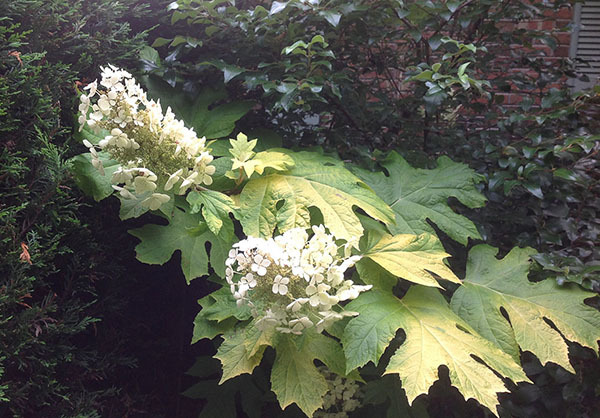 A magnificent double flowering oakleaf hydrangea planted in full shade in the woodland garden next to a red seedling Japanese maple. 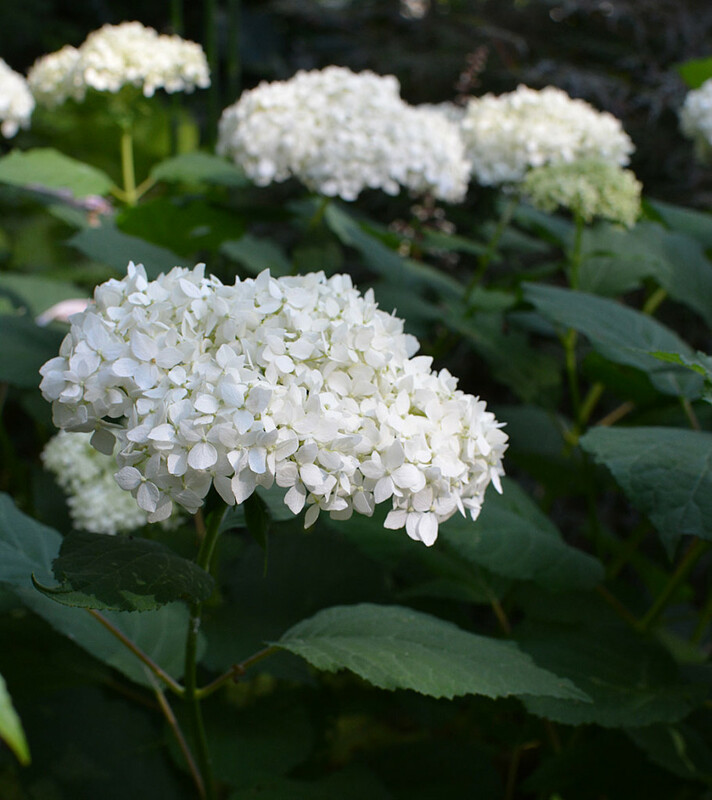 Because this hydrangea is a hybrid, it is sterile and the flowers last a very long time though eventually they also turn pink, then beige over winter. In flower also are two “dwarf” varieties, ‘Pee Wee’ and ‘Little Honey’. They are both planted in a very narrow strip in mostly shade behind a hedge. While descriptions state 3×3 feet, mine are more 4-5 ft. high but narrower. Towards the end of July more hydrangeas will begin to flower. 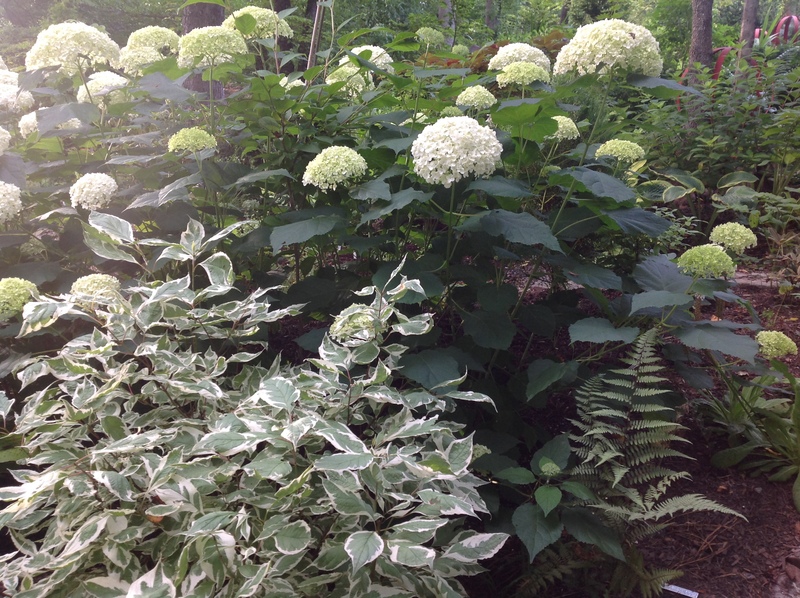 ‘Annabelle’ will be turning green, ‘Snowflake’ will be half white and half turning pinkish, but paniculata types will be opening and stay around until late Fall. Hydrangea quercifolia foliage will begin to turn leaf color as well by August, first slight tinges of oranges and yellows, then becoming scarlet in more sun and finally blood red before turning brownish before leaf drop. Hydrangea arborescens foliage changes to yellows during that same period before dropping while the old flower heads change to beige and stay on most of the winter.